Central Minnesota's Premier Wedding Reception and Ceremony Venue Destination. The Grands at Mulligans is an unforgettable venue for any type of social or business event. 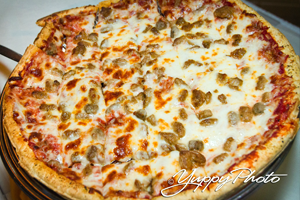 We have a variety of delicious food options to please your guests. Complete photo & video galleries, covering décor, cuisine, facilities, past events and more. Private attached patios that overlook the scenic backdrop of the Pine Ridge Golf Course provide an eye-catching focal point while exchanging vows. Two exclusive rooms with high vaulted ceilings, stone fireplaces, pond, water fountain, large picture windows and the exposed timber structure ensures a very romantic setting. Envision this picture perfect venue… with you at the center of it all. One-on-one attention to detail is a priority for your special day to become a reality. With your personal wedding coordinator and the talent of our Executive Chef combined with our full-service staff, great service and great food is always guaranteed. You are taken care of from the moment you begin the exciting process of planning, to your last dance on your wedding night. Expect this journey to be thoughtful, detailed… and all about you. The Grands at Mulligans surpasses your expectations for a wedding reception and ceremony site. Unique and personal, the Grands offers a refreshing change of venue. The celebration with family and friends. We invite you to share the experience at the Grands at Mulligans. 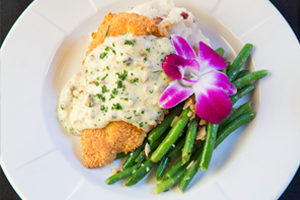 Signature Parmesan Encrusted Chicken Breast served with Roasted Garlic and Mushroom Cream Sauce. 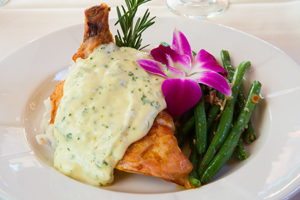 Boursin Cream Sauce served over an Oven Roasted Supreme Chicken Breast. 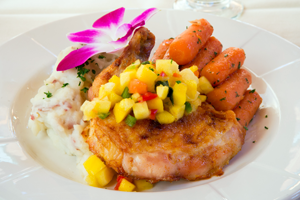 Apricot Honey Rum Sauce and Pineapple Mango Salsa over an Oven Roasted Supreme Chicken Breast. 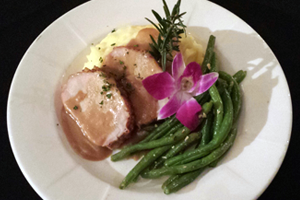 Rosemary and Garlic seasoned Sliced Pork Loin with Red Wine Reduction Sauce. 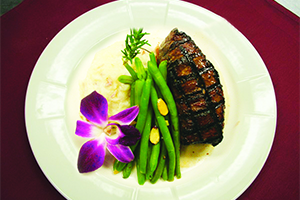 Our Signature Ten ounce Charbroiled Garlic Marinated Sirloin. 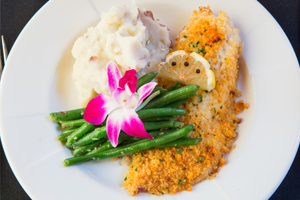 Parmesan Herb Crusted, Broiled Orange Roughy. 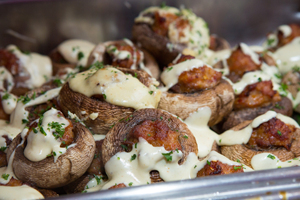 Chorizo Stuffed Mushrooms with Chipotle Pepper Cream Sauce.